One of the most popular medieval shields during the early and middle medieval periods, the kite shield is often associated with the Normans. This Norman Knight Kite Shield allows you to add a historical touch to your home decor. The shield is constructed from 440 stainless steel with a double reinforced border. An ornate golden steel with rivets is used to trim the shield face. Three golden crowns decorate the shield and announce the royalty of the wielder. The crowns rest on a striped red and white pattern. Vein designs give the shield an aged appearance. A chain is included for easy hanging and display. 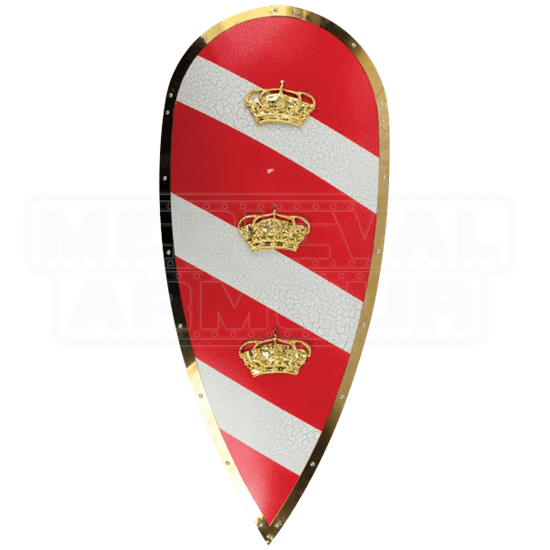 Let everyone know your royal status at your next event by keeping this shield at your side!